There’s just something comforting about devouring a warm, cheesy casserole from the oven. What’s even better is when you know it’s a slightly healthier alternative to the original. 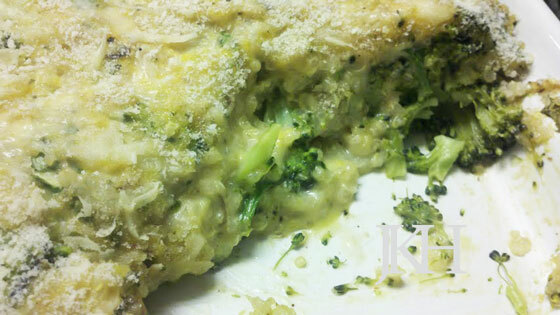 I first spotted this recipe for a broccoli quinoa casserole on Pinterest and knew I wanted to try it. Swapping out rice for protein-packed quinoa? Genius. I made it as is the first time around and it was delicious. When I decided to add some embellishments the second time, it was still just as delicious. The original recipe called for 1/3 cup of mayonnaise, but I used plain Greek yogurt instead. Can’t taste a difference. I also used almond milk instead of cow’s milk because that’s all I had in the fridge. Again, no difference. The recipe calls for a can of condensed cream of broccoli or cream of mushroom soup, but I found a roasted garlic cream of mushroom soup that I prefer. (I might even toss in some minced garlic to the casserole next time for added flavor.) The original called for 2 cups cooked broccoli, but I just bought a large head of broccoli and chopped it up and cooked it. Surely a little extra broccoli can’t hurt. 🙂 Finally, I added a can of sliced water chestnuts and about 2 cups of fresh spinach. To cook quinoa, combine 3/4 cup quinoa with 1 1/2 cups water and a dash of salt in medium saucepan. Bring to a boil, then reduce heat and cover for about 20 minutes or until quinoa tails show. Fluff with a fork. Meanwhile, place chopped broccoli in a steamer and cook 8-10 minutes until tender. Preheat oven to 350. In a large bowl, combine soup, yogurt, cheese and milk. Add sugar, pepper and nutmeg. Then add spinach and water chestnuts, broccoli and quinoa. Mix well. Pour mixture into a casserole dish coated with cooking spray. Grate a little Parmesan cheese on top, and if you want, add some breadcrumbs for a little crunch. Bake for 35-40 minutes and enjoy!